September 15th and 29th at 11:00a.m.-12:00p.m. 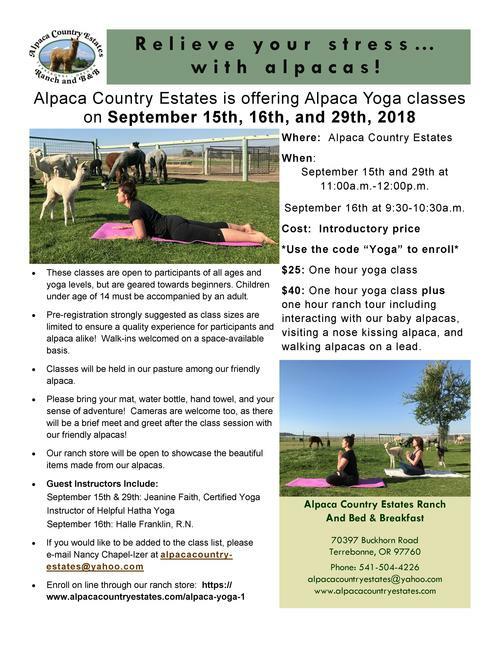 $40: One hour yoga class plus one hour ranch tour including interacting with our baby alpacas, visiting a nose kissing alpaca, and walking alpacas on a lead. These classes are open to participants of all ages and yoga levels, but are geared towards beginners. Children under age of 14 must be accompanied by an adult. Pre-registration strongly suggested as class sizes are limited to ensure a quality experience for participants and alpaca alike! Walk-ins welcomed on a space-available basis. Classes will be held in our pasture among our friendly alpaca. Please bring your mat, water bottle, hand towel, and your sense of adventure! Cameras are welcome too, as there will be a brief meet and greet after the class session with our friendly alpacas! Our ranch store will be open to showcase the beautiful items made from our alpacas. September 16th: Halle Franklin, R.N.